18th century map of the Arabian Peninsula and Persia. Perse, Turquie Asiatique et Arabie. This is an appealing 1786 map of Persia, Arabia and Turkey by French cartographer Louis Brion de la Tour. It covers from the Mediterranean to the Indus River and includes the modern day nations of Saudi Arabia, Israel, Jordan, Turkey, Kuwait, Iran, Iraq, Afghanistan, Yemen, Oman, the United Arab Emirates, the Caucasus, and Bahrain. The map renders the entire region in extraordinary detail offering both topographical and political information. As this map was being prepared, the eastern portions including Turkey, Arabia, and most of the modern day Middle east, were under the waning hegemony of the Ottoman Empire. In Arabia, the first 'Saudi State' had already been established in 1744 and, though owing nominal allegiance to Istanbul, dominated much of the central Arabian Peninsula. The presumably more valuable coastal lands and river valleys of Mesopotamia (modern day Iraq) remained under direct Ottoman suzerainty. Persia at this time was itself experiencing the waning years of the short lived Zand Dynasty who ruled from the capital city of Isfahan - identified here. Within 10 years of this maps issue, in 1794, Aga Muhammad Khan would overthrow Loft Ali Khan, last Shah of the Zand Dynasty, and relocate the capital to the new city of Tehran. The subsequent era, the Qajar Dynasty, witnessed numerous military conflicts with the rising powers of Imperial Russia and the loss of much of Persia's territory. A beautifully engraved title cartouche adorns the bottom left quadrant of the map. To the left and right of the map are paste downs of French text with remarks and description of the map. Surrounding the whole is an elaborate decorative border featuring floral arrangements, surveying tools, elaborate baroque scalloping, and a winged globe. This map was issued as plate no. 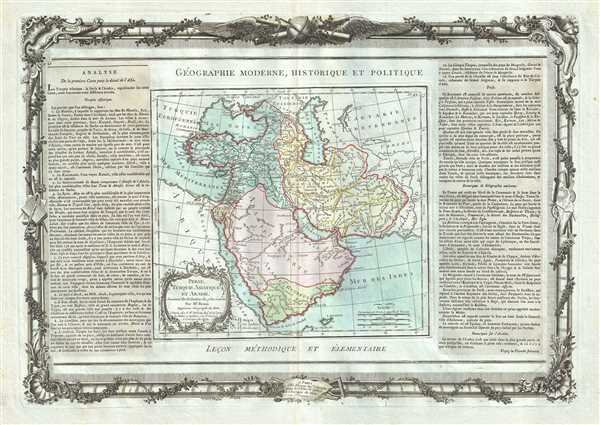 42 in the most deluxe edition of Desnos’ 1786 Atlas General Methodique et Elementaire, Pour l’Etude de la Geographie et de l’Histoire Moderne.